The Netherlands, current world champions, and the United States won gold medals in the teams competition (open and women’s series) of the inaugural SportAccord World Mind Sports Games, held in Beijing, China, 9th – 16th December 2011. In the pairs, the open series was won by China’s Xu Hou and Miao Shi, while USA took first place in the women with Lyn Deas and Beth Palmer. Finally, in the individual, USA won both series, thanks to Chris Willenken and Janice Seamon-Molson. The competitions got under way after a spectacular opening ceremony, and continued in the spirit of excellent organization and warm hospitality which left all athletes most satisfied. There was an enormous television and internet coverage of the various sports involved, which is expected to boost the results of their promotion efforts. 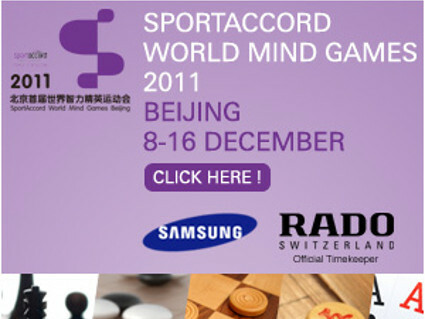 Featuring the world’s top athletes in the respective fields, the inaugural SportAccord World Mind Games took place in in the Beijing International Convention Center, in Beijing, China, 9-16 December 2011. Five mind sports participated in the SportAccord World Mind Games: Bridge,Chess, Draughts, Go and Xiang Qi (Chinese chess). Some 150 top athletes competed in the event which was presented by IMSA and was accompanied by a cultural program. Winners, medalists and players received attractive prize money according to their results. IMSA is the International Mind Sports Association. SportAccord is the umbrella organization for all (Olympic and non-Olympic) inter­national sports federations as well as organizers of multi-sports games and sport-related international associations.